This Kshetra is known for the stone Garuda Vahana which becomes heavy in stages when taken out; initially requiring four persons in the sannadhi and requires sixty four persons to carry at the end. This Garuda is treated in equivalence to Lord Vinayaka and so the dish Mothakam named as "Amudha Kalasam" is offered to him. Here Thayar(Nacchiyar) gets preference in all uthsavas and hence called Nacchiyar Kovil. During Uthsava days Nacchiyar comes out first to give darshan. The Lord Himself became guru( Acharya) and performed Panchasamaskara to Tirumangai azhwar at this place. Brahmothsavam during Dhanurmasam (Margazhi- Dec-Jan) is celebrated in grand manner. The kshetra has fragrance all over and hence called Narayur (The word for fragrance in Tamil is Narumanam). There is huge tank 648 feet long and 225 feet wide in front of the temple, It has a number of steps in the 3 sides. This tank is like a river and so it is called as "Mani Muthaaru". There is a beautiful tale behind the name of this pond. Once king of the birds Garuda, took a diamond head ornament to Narayur Nambi from Thiruparkadal. A diamond (Mani) accidentally fell from the ornaments into this pond. As the precious stone fell into the pond degrading it's status to ordinary pearl (Muthu), this tank is known as Mani + Muthi + Aaru (tank or pond). Festival : There are two Bramotsavarams in this temple annually. One in the tamil Month Panguni(March-April) for 9 days ending on Full Moon day. The Other is in the tamil Month Margazhi(December-January) for 9 days ending on Dwadesi(Suklapaksham). On both festival the Garudasevai is on the 4th day. Teppotsavam in the nights are called as "Mukkodi Utsavam". The other festival celebrated here is the "Thirukalyana Utsavam" in the tamil month Avani(August-September) on the Star Visakam. Approach : This temples is at the 6th mile from Kumbakonam on Kumbakonam-Thiruvarur route. It is better known as "Nachiyyar Koil". Access to the temple One can reach the Kshetra from Kumbakonam on the way to Thiruvaroor. This Kshetra is also known as " Sugandha Giri " . The diety at this temple has only two hands unlike the others who have four. Thirumangaiazhwar was given the " Panchasamskaram " at this Kshetra by the diety Himself. The Moolavar of this sthalam is Thirunarayur Namb (Nachiyar Nambi) Also called as. Srinivasan and Vasudevan. The Moolavar is giving his seva in standing posture being ready to marry the Thaayar, facing east (Kalyana thirukkolam). 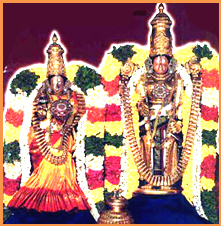 Prathyaksham for Medavi Munivar and Brahma devan. This temples is at the 6th mile from Kumbakonam on Kumbakonam-Thiruvarur route. It is better known as "Nachiyyar Koil". The temple is on road-side and no much facilities are available here. Either we had stay at Kumbakonam or at Oppiliyapar Temple and visit this temple.